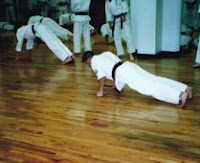 Memories of a Nidan: Green Belt...so what? Just as I thought I reached a pinnacle of sorts, having braved my Sanchin Kime and earned my green, they raised the bar and lowered the boom. Just when I thought I had the Gekisai kata series down pat I was told that wasn't so..."too stiff, loosen up, get down in that shiko, got no balance in your niko, man, you gotta work that kata." Endless bunkai with browns and blacks..."don't tell me you're tired, don't look at me with those sad eyes, block, this isn't a dance, close your mouth, breathe through your nose and out your mouth, Morales, where the hell are you looking, focus." In other words and in the words of the George Shearing song: "Pick yourself up, take a deep breath, dust yourself off and start all over again." Because you're only as good as your last kata, there is no end to learning, no end to training, no end to slipping back, crawling forward, and doing it one more time again and again and again. Karate must be done in any state of mind: sad, happy, tired, revved up, whatever,whenever, however, until it is like breathing or walking...you just do it. Because what's the worst thing that could happen, rhetorically chimes in the Sensei, that you die? Well die with dignity and grace.